"It's a big surprise to get Acer CloudMobile from my dad as my Christmas gift. And I wish to enjoy Christmas-themed DVD with my parent on Christmas eve. What embarrassed me is that this cellphone is devoid of DVD drive, any solution to import DVD to CloudMobile?" The CloudMobile has already enjoyed a rare Engadget accolade: 4.3" HD screen boasting a 1280x720 pixels definition and reasonable price tag, all making visual experience super awesome. But devoid of DVD drive, many users feel a bit underwhelmed for inability to play new movie DVD releases on Acer CloudMobile directly. In this way, it’s necessary to convert DVD to Cloud Mobile compatible format first for playback later. Actually, it’s really a piece of cake to turn DVD to a video format playable on Cloud Mobile as long as you have a DVD to CloudMobile converter. However, such software claiming the ability to rip DVD to Cloud Mobile is usually all at sea when it comes to DVDs with copy protection. Under the circumstances, all you need is a DVD ripper proficient in decrypting DVD as well as ripping DVD to Cloud Mobile friendly format. Here MacX DVD Ripper Pro can help you out of dilemma, making DVD to CloudMobile conversion on Mac all at one fell swoop without any hassle. What strikes a chord with everyone is that this newly upgraded DVD converter not only receives high reputation for its DVD decrypting and ripping features, but also is intrigued by its ultrafast ripping speed and wizard-style interface, all empowering Mac users to convert DVD to Cloud Mobile MPEG 4/H264 in a few clicks. Free download the high-ending encrypted DVD ripper and 1:1 rip encrypted DVD to Acer Cloud mobile with zero quality loss and blazing-fast speed. For Windows users, you can simply download Windows Version DVD to CloudMobile Converter for Mac on PC. Download, install and run this DVD ripper for Mac before importing DVD. Then, hit "DVD Disc" button to finish the DVD source importation. Alternatively, you can hit "DVD Path" to import this disc. Then go to "Output Profile" drop-down box to pick up Cloud Mobile accepted format as the output format, say H264/MPEG4. By the way, this DVD to RAZR HD converter also offers output profiles for other Acer mobiles, so you can choose to rip new DVD movies to Acer mobile like Acer Liquid Z6 Plus/Z6/Zest Plus/Zest 4G/Zest/Jade 2, Liquid Gallant E350/Duo or Liquid Glow as you like. Click bottom-right "RUN" to start to rip DVD to CloudMobile recognized video on Mac. Tips: delightfully, the optimized DVD video editing functions enable users to crop video file size, trim video segment, merge video files, import external subtitle file (*.srt) to realize different needs. What's more, for those who are lazy to rip DVD to gadgets they have one by one, simply rip DVD to MP4 that is almost playable on any devices like iPhone, iPad, Galaxy S3, HTC, etc. BTW, if you want to enjoy DVD content on iPhone iPad iPod, you can use MacX MediaTrans to transfer the converted DVD video from Mac/PC to iOS devices for playback with ease. The tutorial focuses on the solution to rip DVD to HTC One readable format in a snap. With the best DVD to HTC ripper in hand, you can convert protected DVD to the new HTC One, HTC One X/S/V limitlessly with optimal quality. Wanna enjoy your DVD movies on Galaxy S III? 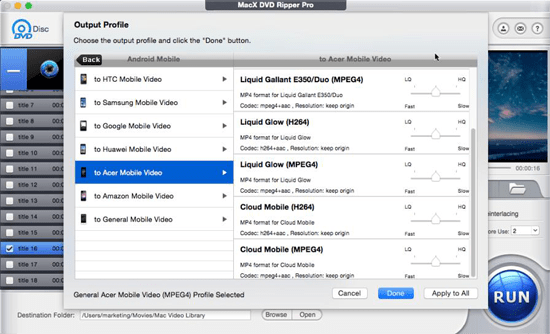 MacX DVD Ripper Pro is you best choice, helping you rip DVD to Galaxy S III on Mac. Hence, you can watch the DVD you like on Galaxy S III on the go. Notice: We only advocate using this best DVD ripper to rip commercial DVDs to Acer CloudMobile under the concept of Fair Use and do not encourage any illegal reproduction or distribution of copyrighted content. Please abide by the local DVD copyright law before doing it.